Glen and I are so proud of Shadow Run Johnny Be Good. 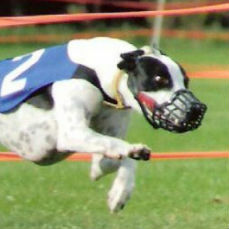 At WRAG's first 350 yard oval (that was pre approved in 2007) and 4 program and an entry of over 20 whippets, Johnny earned his final 1/2 point by winning the bottom points and that coveted title of ORC. While Shadow Run Marco ORC, won the meet with 3 National points. On Saturday we had a fantastic holiday BBQ, and some practices and box training, along with a demonstration of hydrotherapy by our own Shadow Run Blocker ORC who is a master water whippet. We had a number of whippets test the 89 degree pool for the first time and seemed to enjoy it as well as their owners on this beautiful sunny weekend. We want to thank all the volunteers that helped put on this meet for without them it wouldn't happen.